There are moments in our lives that become the most important, and for me one such moment was back in 2007 at the Friends for Life (FFL) conference being held at Disney’s Coronado Springs Resort. I’ve thought about writing this post for quite some time, but because it’s so personal I really wanted to wait for the right moment to do so. Something happened at Friends for Life this year that made me realize there’s no better time to do it. As the set up for FFL began, word got back to us that there had been a young boy from Australia competing in the martial arts competition who was now in the hospital because he had been diagnosed with Type 1 diabetes. At the time I was only about 13. My other friends were all around the same age, the oldest of our group being 17 or so. The beauty of our group at FFL is that no matter where we are or what we’re doing, we have a blast. Had we been a regular group of teens, we would’ve been more nervous realizing that we were about to take on something really big. Instead we were having a blast chatting away and laughing at dumb jokes in the car. Kara texted me a quote yesterday that I think perfectly sums up our relationship within the entire CWD community: “Sometimes the most ordinary things could be made extraordinary, simply by doing them with the right people.” Cliche as it may be, it’s the truth. We have a blast doing arbitrary things like hanging out in someone’s hotel room or watching TV. It’s not about where we are or what we’re doing, it’s about the fact that we’re together. At any rate, we finally got to the right hospital, and then things set in a little bit. Most of it has actually become a blur to me. I can’t remember the moments right before going up to see Louis, other than that it had been established how serious this was and that we had to just stay calm and go with the flow — all the while knowing that we might not even be allowed to go into his room. We finally got up the floor he was on, and I distinctly remember a sliding glass door that led into the part of the floor where patients were being held. There was a red line that we had to stand behind until the door had been opened, allowing us access. We decided it would be best to go in one or two at a time, starting with my dad and Kenny. Then we each waited until being signaled that we could go in. I’ll never forget that moment. Louis just looked so small in the hospital bed with the IV in his arm. I remember seeing his parents crying because they couldn’t believe all of us teens had Type 1 diabetes. I remember realizing that no matter what happened in life, this group of people would always be family, especially after what we had gone through together that day. I can’t remember the exact conversations, but I remember that there were a lot of tears, laughs, and a lot of, “everything is going to be OK!” This is a picture of the group of us (Louis is in yellow) the very first day at the hospital. Maryam and friends visiting Louis in the hospital. The entire experience was incredible and still makes me emotional five years later. There’s nothing quite like seeing someone’s fear dissipate as they realize they’ll be fine and that an incredible group of young people just like them exists beyond the hospital walls. A few days later Louis was discharged from the hospital and he joined us at the conference just in time for our favorite part, the teen dance! We got him out of his shell right away, and I distinctly remember at one point Giulio and some other teens had Louis literally up in the air and on their shoulders. Fast-forward five years later, and Louis has become a conference regular. He actually missed one or two because of timing with his school, but this year it was a last-minute surprise that he’d be coming! On the Thursday night of every FFL conference, there’s a huge banquet that everyone attends. It’s one of the few times that everyone from the conference, no matter what age, gets to come together in one room. The night of the banquet, some awards are given out. My all-time favorite award every year is the “Unexpected Hero Award,” because it always ends up going to someone incredible who really doesn’t expect it. All of a sudden, it was time for that award! Laura Billetdeaux (the incredible woman who organizes the entire conference) called up Louis to the stage. Naturally, being the obnoxiously enthusiastic group that we are, we went wild. She started telling Louis’ story to the entire room, and then she started saying something about needing Louis to help her give the award to some people in the room. I immediately knew it was my dad, because after what he did in spearheading the efforts with Louis, he had been put in charge of the “First Timers” part of the conference. 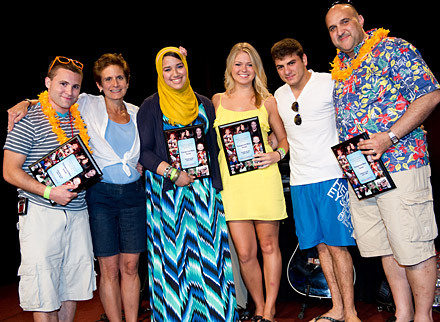 Maryam and friends receiving the Unexpected Hero Award. Courtesy of Children with Diabetes. Being up there and seeing the standing ovation was overwhelming, but the reason I got most emotional was realizing that a lot of friends were not on that stage with us because they were abroad. It made me really miss the people who weren’t there, but also appreciate those who were because of how much this group at the conference has formed who I am. I just want to take a quick moment to say thank you to every teen (now young adult!!) who was a part of that day. You are all a part of my family. I also want to give a huge shout out to Natalie Bellini, who I’ve written about before. If it wasn’t for the way Natalie treated those of us newly diagnosed with diabetes, we would never understand the importance of being there for someone who is still in the “lost” stage of dealing with diabetes. After getting off stage, I found Natalie, and we just hugged and cried for a long time. I love Natalie so much and owe her everything. Finally, I want to thank Jeff Hitchcock and Laura Billetdeaux who are everything to this community of people with Type 1. They have changed our world and don’t get nearly enough recognition for all that they’ve done. So, thank you both.